When pundits, politicians, or advocates have talked about the need to reduce fossil fuel production to combat climate change, one of the most common rejoinders has been to appeal to that most central of American concerns – it creates a lot of jobs. Oil industry backers are often touting the notion that it creates lots of decent-paying jobs. It’s also why Trump loves coal; these are generally perceived as very solid and very American jobs. We know by now that there are actually comparatively very few coal jobs left. But oil and gas companies are automating their workforces, and there’s about to be many fewer of them, too. Last week, I looked at the numerous ways that tech companies like Google are helping the oil industry use AI and automate its processes; the emphasis was on the fact that Silicon Valley was seeking profit in fossil fuel extraction at the height of climate change, but the subtext was that there will be fewer workers employed by the sector as well. That followed a $47 billion effort to digitise parts of oil production, per the IEA. As I understand it, that covers everything from software automation to networking oil rigs, to automating drilling systems. 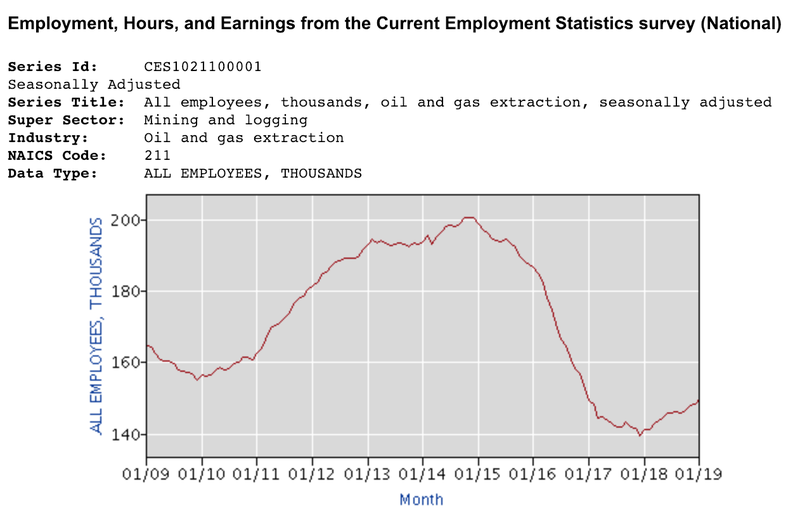 And as a result, tens of thousands of lost workers amounted only to a minor drop in oil output. Cindy Taylor, president and CEO of Oil States International, said overall job growth this year will be light, even with a moderate rebound in crude oil prices. ... Taylor said the oil and gas industry is contending with more efficient technologies, reducing the need for new jobs. This following myriad other reports of falling jobs across the sector in recent years. But because it’s becoming increasingly clear that automation is going to eliminate a lot of jobs through attrition, oil, with its boom and bust employment cycle, will be especially prone to seeing its job numbers plummet – much, probably, to management’s liking. The fossil-fuel-for-jobs argument has been losing ground for years, especially as by some counts solar power employment has eclipsed that of the oil and gas sector, and has of course always been based on a wobbly premise at best – if someone’s livelihood is contributing to climate change, the emphasis should be placed on finding and transitioning to other avenues of work. Still, the enduring fossil fuels as jobs creator mythos is slated to take a blow, as automation starts culling its workforce.